Researchers at John Hopkins Bloomberg School of Public Health have conducted a study on two tribes that shed new light on the role the Western diet plays on blood pressure. The study involved a South American tribe which lives in near total isolation and has no Western dietary influences and a nearby tribe which is more exposed to Western dietary influences. Researchers took blood pressure measurements from 72 Yanomami tribe members aged one to 60 and found no trends that pointed to lower or higher readings as the participants aged. Blood pressure measurements were also taken from 83 members of the neighboring tribe where there were Western dietary influences. They found a very clear trend pointing to higher blood pressure readings with advancing age. The Yanomami tribe are hunter gatherers and also gardeners in a very remote rain forest region in Northern Brazil and Southern Venezuela. Their diet is low in salt and fat and high in fiber and fruits. Previous studies beginning in the 1980s have shown that obesity and atherosclerosis are virtually unknown among this tribe. They have extraordinarily low average blood pressure which does not appear to increase with age. This study has shown that the age stability of blood pressure among this tribe begins in early childhood. It is the first study to compare this tribe to the nearby Yekwana tribe which has experienced an exposure to Western influenced lifestyles and diet. In the United States and most other countries, blood pressure increases with age beginning early in life. The studies results support the thought that the tendency in Westernized societies for blood pressure to increase with age is not part of the natural aging process but might be the result of the cumulative effect of the Western lifestyle and diet. The team found the blood pressures of the Yanomami tribe to be averaged at 95 systolic over 63 diastolic. In the United States the average systolic is 122 and 71 diastolic. The data shows that blood pressure within the Yanomami population remains very close to the same low levels from one to at least through the age of 60. 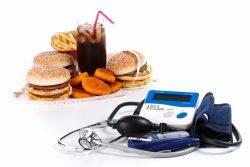 In contrast, the Yekwana who have been exposed to Western lifestyle and diet which includes processed foods was statistically indicating clear trends towards increasing blood pressure levels with advancing age. The Yekwana tribe members showed levels averaging 5.8 mm Hg higher by the age of 10 and 15.9 mm Hg higher by the age of 50. With this age related increase in blood pressure which begins in early childhood, an opportunity exists for lifestyle and diet interventions to prevent later increases in blood pressure readings. In the United States, systolic blood pressure increases by about 1.5 mm Hg. and 1.9 mm Hg per year among girls and boys respectively and 0.6 mm Hg per year among adults. The research team involved is this study plans to follow up with a study of gut bacteria among the two tribes to determine if gut microbiome accounts for the tribe’s differences in blood pressure with aging. Previous articleHow Important is Genetics for Longevity?